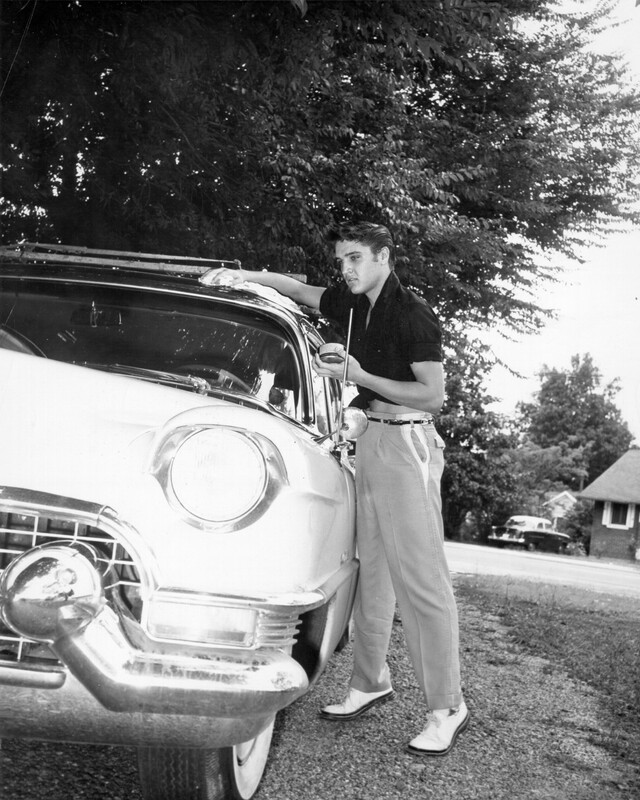 Elvis’ penchant for buying cars, especially Cadillacs, is well known. A salesman at Southern Motors, one of the leading Cadillac dealers in Memphis, once estimated that Elvis had bought more than 30 Cadillacs from that dealership alone, not to mention other dealerships. 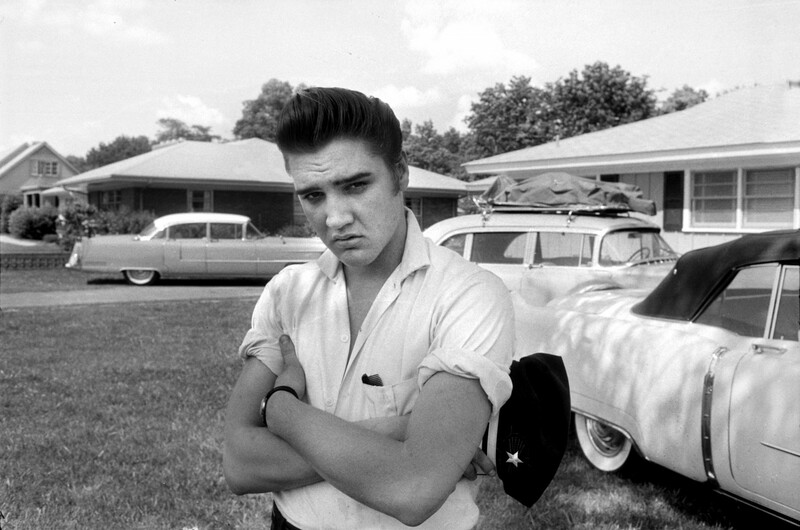 Elvis famously bought scores of Cadillacs for himself, his family, his friends and even for total strangers. In part thanks to Elvis, Cadillac has become synonymous with rock ‘n’ roll. 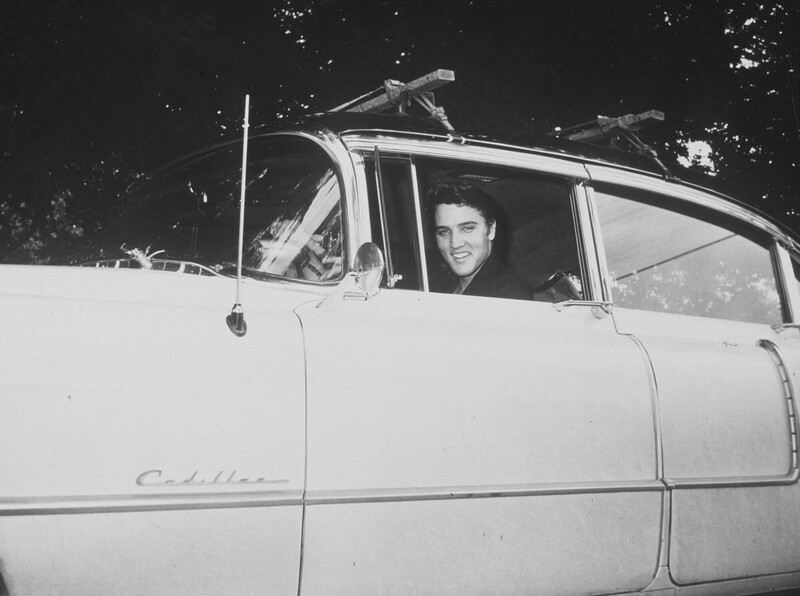 In this article we focus on the Cadillacs owned by Elvis between 1955 and 1964. Let’s put this article in first gear and head back to March 1955, when Elvis got his first Cadillac. Buckle up, and enjoy the ride! 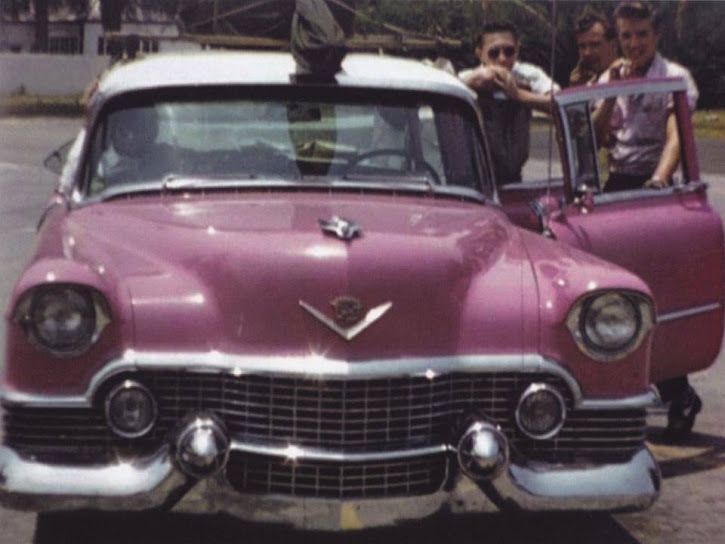 Elvis purchased his first Cadillac, a pink and white model, in March 1955. He mainly used the car to transport himself and his back-up musicians, Scotty Moore and Bill Black, who were billed as the Blue Moon Boys, to gigs around the south. Elvis had made it known to friends and fellow performers, that it had always been his dream to own a pink Cadillac. The photos we see to the right and below to the left, are from Meridian, MS., when Elvis, Scotty and Bill joined the annual Jimmie Rodgers Memorial Festival on May 26, 1955. 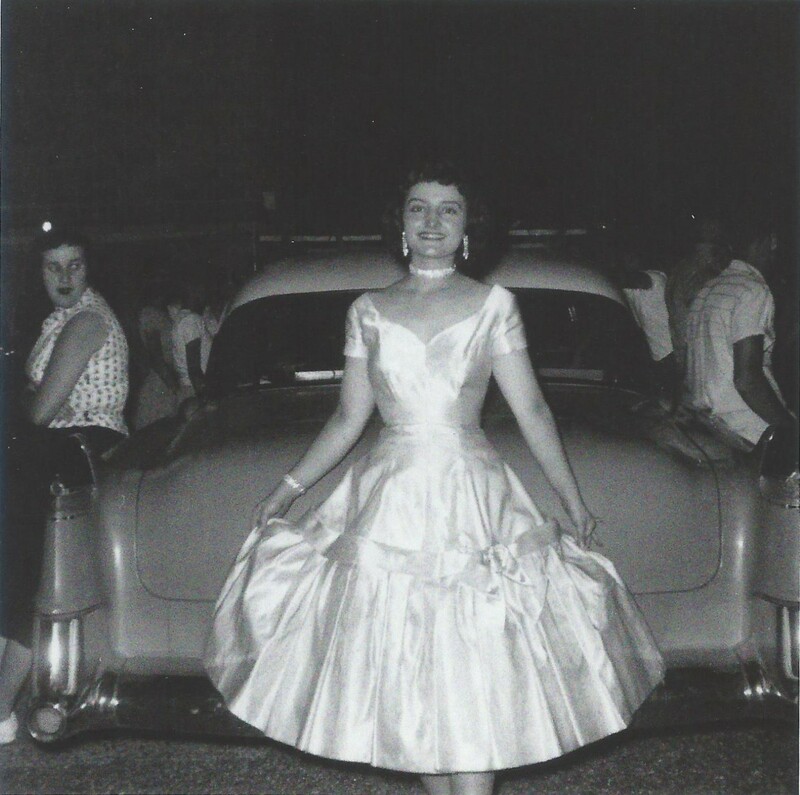 The image below to the right shows friend Shirley Searcy leaning on the back of the ’54 in Hope, AR. 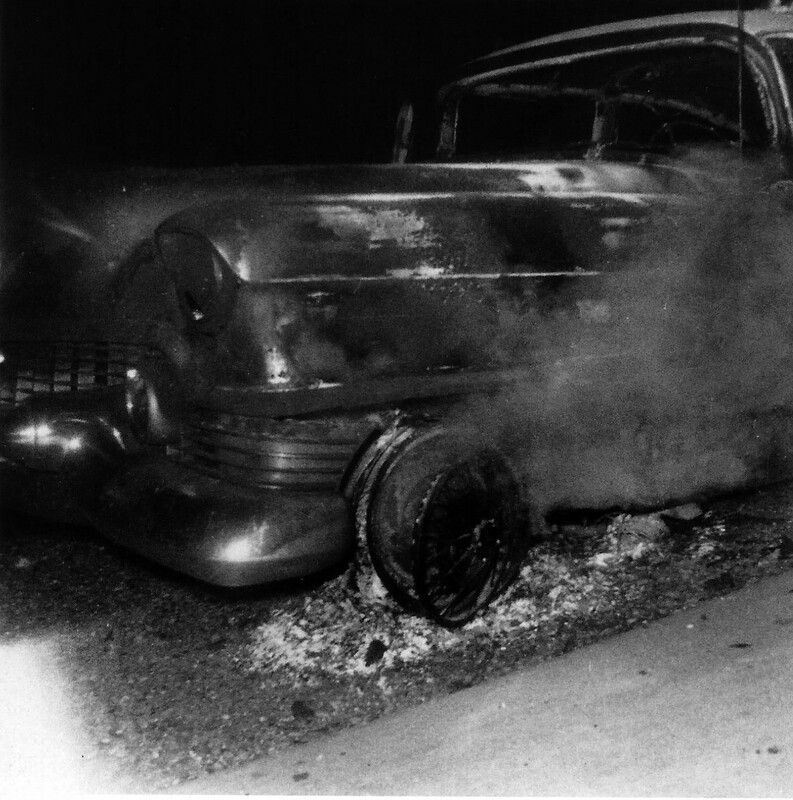 Tragedy struck, when Elvis’ first Cadillac was destroyed by fire on Highway 67 West, near Fulton, AR. 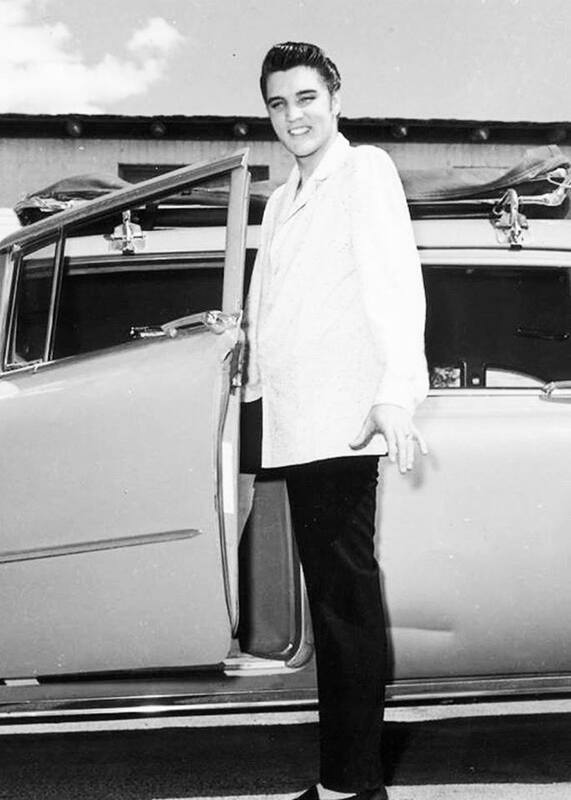 It was in Tampa, FL., on July 31, that Elvis received the keys of his first brand new Cadillac. 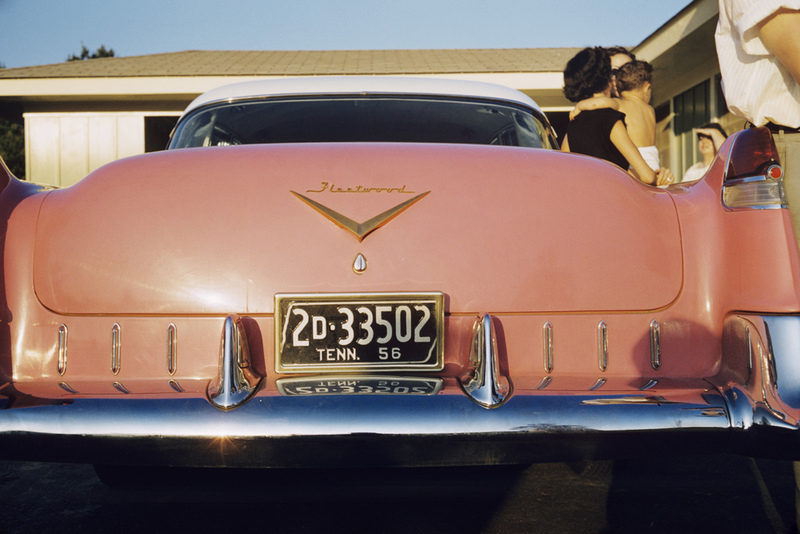 This pink and white Cadillac Fleetwood (originally blue in color, with a black roof), is said to have been his favorite and the one car he never sold. Elvis’ performance on that special day in Tampa was photographed by William V. ‘Red’ Robertson. 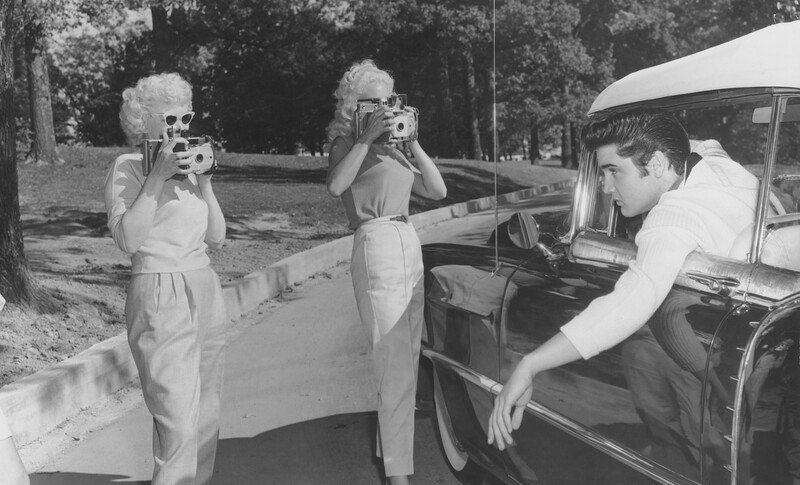 One of his photos would end up on the iconic cover of Elvis’ debut LP. Tampa Morning Tribune journalist Leland Hawes, watched over Elvis’ car that evening because Elvis didn’t want lipstick imprints and love you notes all over his brand new baby. The photo to the right is from October 12, 1955, Midland, TX. 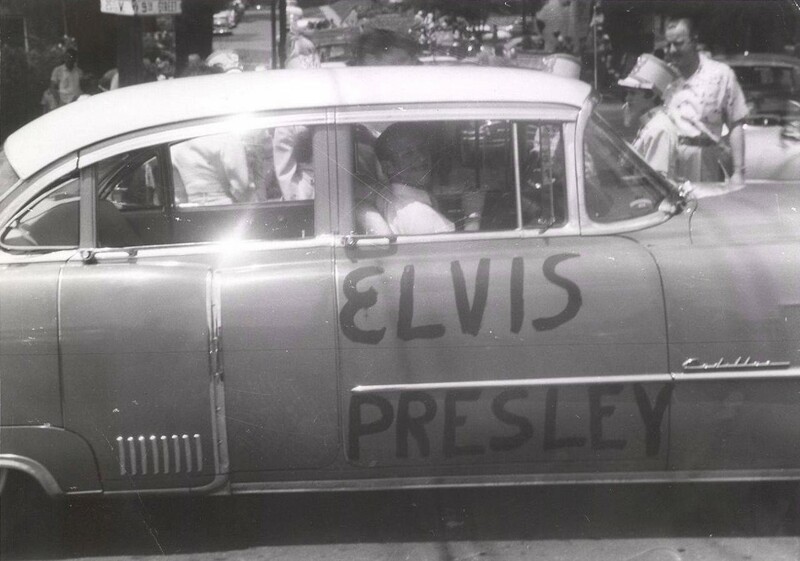 In February 1956, Elvis had the upholstery replaced as well as getting some paint work done. This was also when the black roof was painted white. The photo to the left is from July 5, 1956, when Elvis visited Ellen Mincey, age 12, at St. Joseph’s Hospital. She and her mother were injured in a car accident the previous day and had to miss out on Elvis’ Russwood Park show that day. The two photos below, in which we can spot the removable wooden roof rack that supported the band’s gear, are from August 1955. 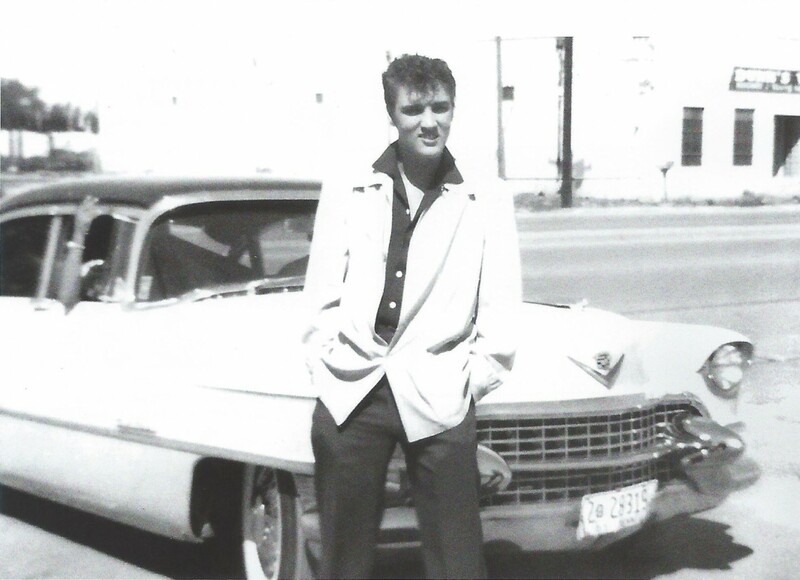 On September 2, 1955, Elvis’ newly purchased ’55 Cadillac Fleetwood was damage driven by Scotty. About 7 or 8 miles from Texarkana, Scotty was passing a pick-up truck that first pulled to the right but then made a left turn, ending Scotty in a ditch. The next day, Elvis and the boys were in desperate need of transportation, while the pink Caddy needed $ 1000,- of repairs. Either on the 3rd of September or the day before, Elvis purchased a ’54 apollo gold convertible for $ 4.995.- in Texarkana. 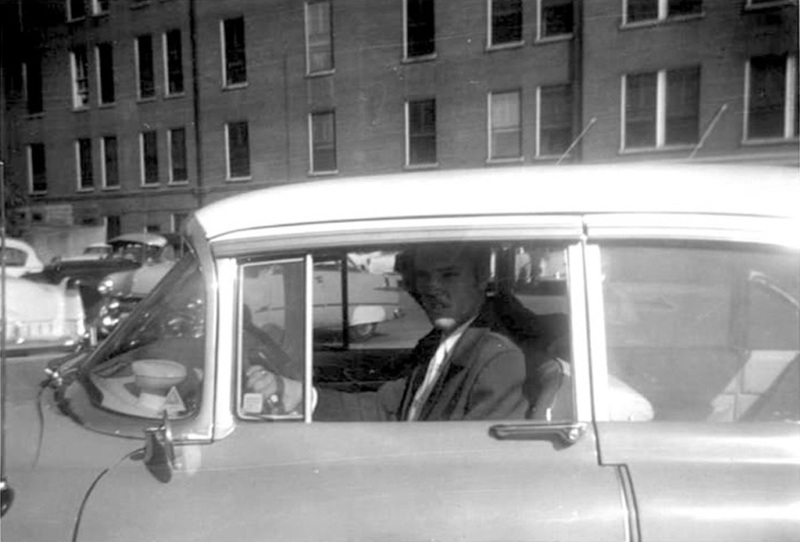 On September 13, 1955, in New Bern, NC, Sam Phillips took out his own insurance policy on the convertible. 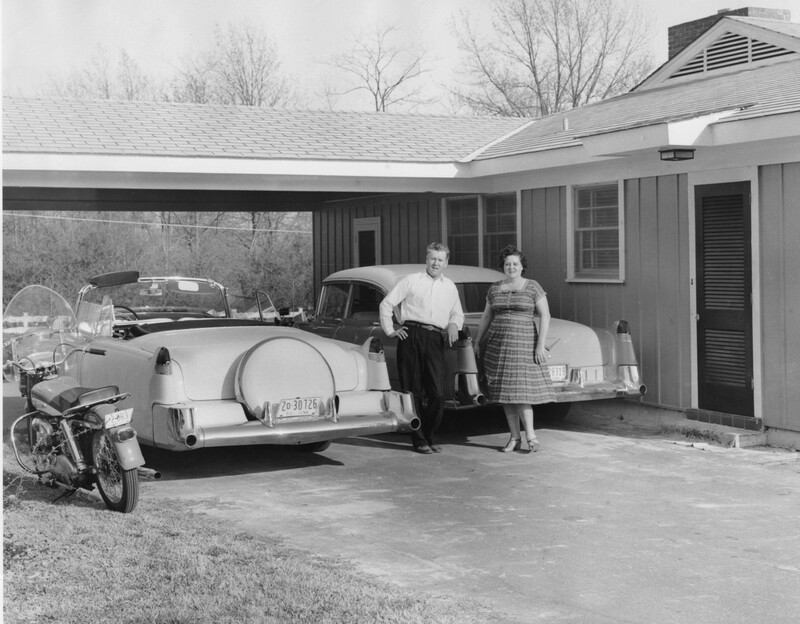 Phillips’ policy on this car was purchased in order to limit SUN Records’ liability due to three previous incidents. 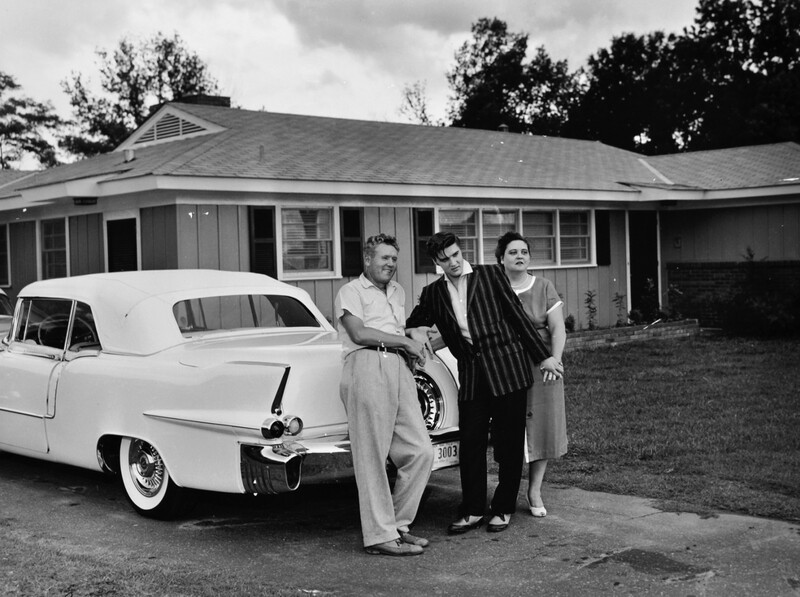 In the image below, Elvis’ parents proudly pose with the ’54 convertible and the ’55 Fleetwood. Elvis’ Harley Davidson Flathead KH Deluxe can also be seen in this mid 1956 photo. At the start of the new year, Presley was, yet again, in need of new wheels. 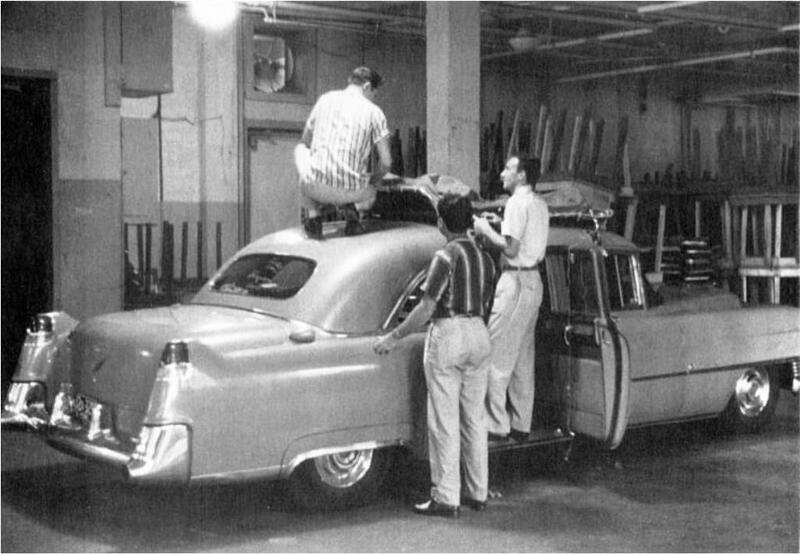 He figured he’d be doing a lot of touring in 1956, so he needed a car big enough to carry himself and his musicians as well as their instruments. At Southern Motors in downtown Memphis, Elvis purchased an 8 passenger ‘Presidential’ limousine. This ’54 series 75 limousine (in fact a 1955 model), was originally blue in color and re-painted in canary yellow somewhere between August and October 1956. To the right we see the limo in it’s original color. Elvis, apparently, couldn’t afford to buy a new car. The two recent road incidents must have been financially draining. So he put ten percent ($ 600,-) down on the ’54 Fleetwood limousine and financed the rest of this $ 6.000,- purchase. Since Elvis was not 21 yet, his father Vernon had to co-sign the contract. 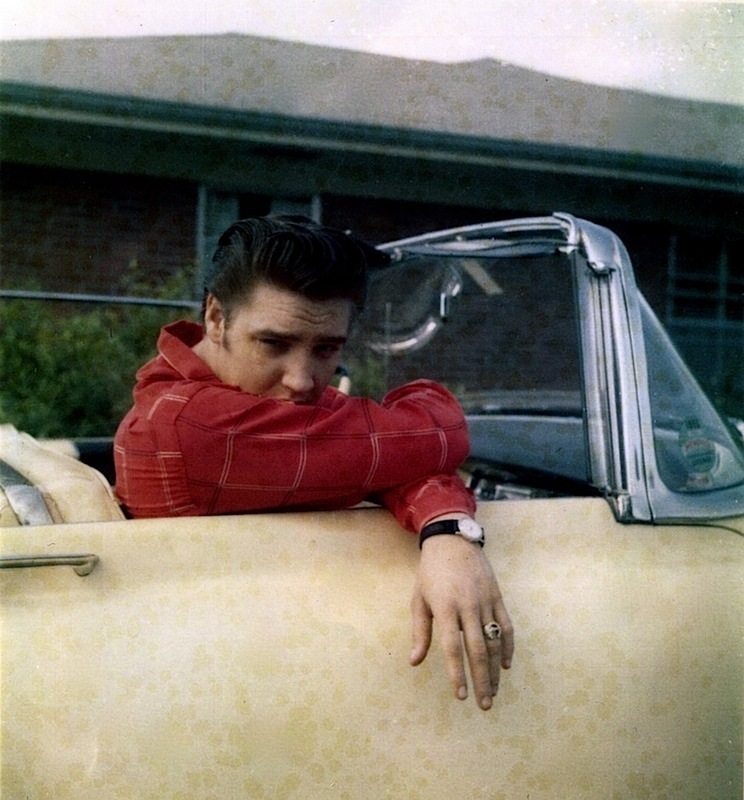 Elvis and the boys took this car on the road with them from circa March 1956 onwards. 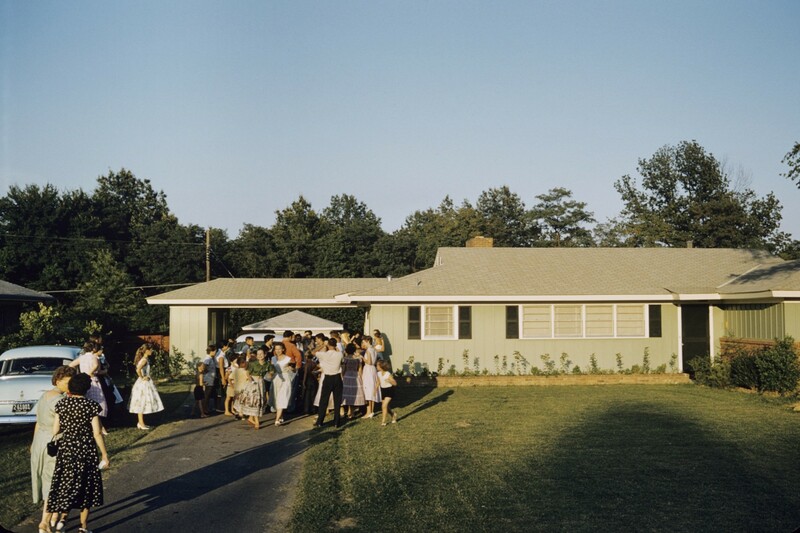 The photo to the left was taken during the Florida tour in August 1956. In the photo to the left, Bill Black is posing with the Fleetwood. 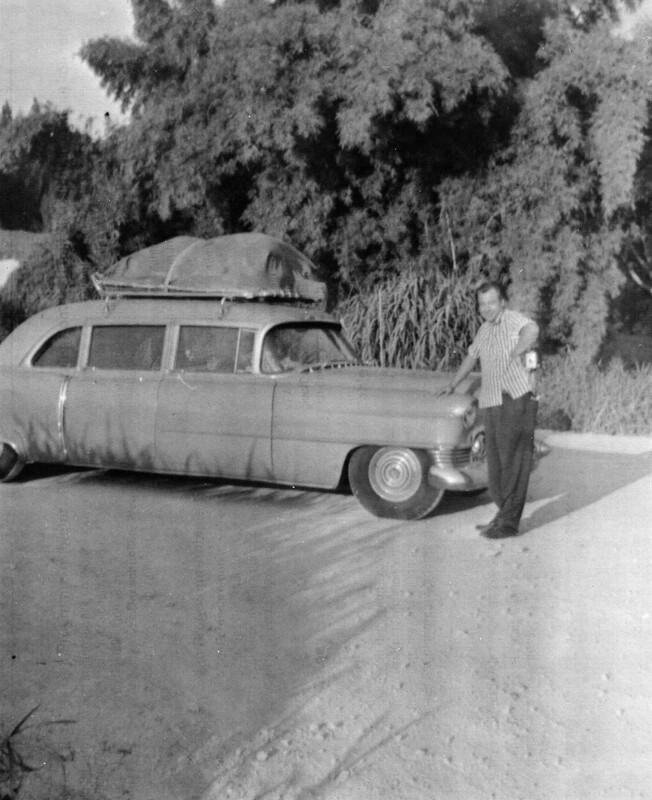 The car was also part of Elvis’ first ever trip to Las Vegas, as seen in the April ’56 pic to the right. And in the cool June 1956 photo below, we can see the pink 1955 Fleetwood Series 60, the 1954 Fleetwood 75 Limo, and the 1954 apollo gold Series 62 convertible. The new-for-1956 Cadillac represented a significant step forward in their tradition of unending search for automotive perfection. In 1956 Cadillac introduced the Biarritz name to distinguish their Convertible from the newly named Eldorado Seville Coupe. With only 2,150 examples built, this Biarritz is truly a masterpiece of Cadillac craftsmanship, one that Presley wanted! On June 11, Elvis drove his pink Cadillac up the driveway when Vernon told him the new Cadillac was ready for delivery but he had to fly to Houston to get it. They drove the ivory-white Cadillac Eldorado Biarritz convertible back to Memphis on June 13th. Originally white with a black interior, Elvis told the customiser, Jimmy Sanders of Memphis [his former neighbour, from Lamar Avenue, and who also customised the ’55 Fleetwood], to change the color in GRAPE. The upholstery was changed to white roll and pleated leather, and the floor covered in mouton fur dyed purple. Elvis’s initials “EP” entwined with a guitar and two musical notes inscribed in leather adorned the floormats and overhead. 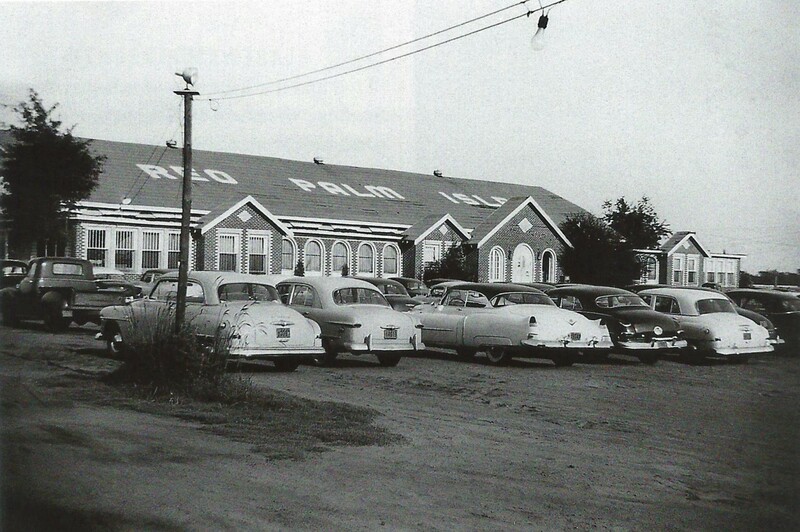 To the right we see the (not yet) pink Caddy, at the Reo Palm Isle in Longview, TX, on August 11, 1955. Thanks for an interesting read. I like how Elvis always kept the pink Cadillac, like holding on to a dream! Very interesting. I enjoyed this article and the photos immensely. Thanks for sharing this Caddy information Robert. Nice article! Love the photos! Wow so many lovely cars, I sure would have liked a ride in his pink caddy. Great photos!! Last picture is a ’53 Caddy, not a ’55.